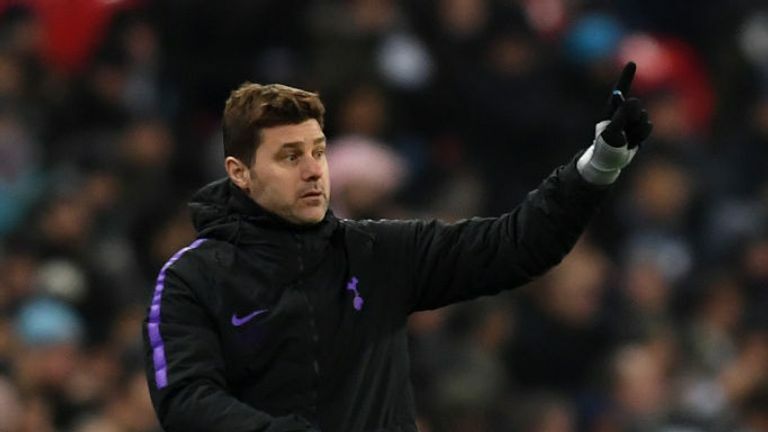 Mauricio Pochettino said Tottenham are being underestimated after they beat Borussia Dortmund 3-0 in the first leg of their Champions League last-16 tie. Dortmund started brightly at Wembley but Tottenham seized control of the match with second-half goals from Heung-Min Son, Jan Vertonghen and Fernando Llorente. The win was Spurs' fourth in a row in all competitions, all of which have been achieved without injured duo Harry Kane and Dele Alli. Asked about Spurs winning again without two of their key players, Pochettino said: "It's good because the expectation when people watch Tottenham is not only to win, it's to see a performance like the dream team of Barcelona with [Johan] Cruyff or Milan of Arrigo Sacchi. "That is very good, we feel very proud when people expect that from our performance, but sometimes people underestimate us. "We play much better than people assess us sometimes, but you cannot fight with the perception of people. I am happy with the performance and the circumstances we have. "Many things happen and the team is fighting, getting results, I feel so proud for that. My players are heroes, whatever happens, they deserve full credit and a lot of praise. What they are doing this season is amazing." Reflecting on the second-half improvement from Spurs, Pochettino said: "The first half was very difficult. Our feeling was we never felt the confidence to play. We made some rushed decisions, we were not comfortable and didn't feel how we planned to play. "But after fixing some problems and showing some clips at half-time and talking different positions in offence and defence to try to help the performance, with a little bit of luck - because confidence is a massive boost when you score - that helped the team perform much better. "It's a massive victory and the players deserve all the credit because they were fantastic." Spurs will now travel to Dortmund for the return leg in a strong position, but Pochettino added: "For me, it's only the first leg and first half of the tie. "Of course 3-0 is a very good result but when you have a team in front of you like Borussia Dortmund I think always you respect them and of course we need to think we need to go to Dortmund with the idea to win. "Of course we are happy now because it's a good result but there's still a lot of work to do."